When it's time for the family to get together and make Christmas ornaments and decorations or trim the tree, it's always a challenge to find activities to keep toddlers interested and involved. These Christmas activities for toddlers can teach concepts about Christmas and help children feel helpful and included in traditional holiday events. Like using stencils or sponge painting, a cookie cutter can help your toddler create something he recognizes when he doesn't know how to draw the object. It's also a good starting point for toddlers who are reluctant to participate because they don't want to get messy or like the way tactile activities like finger painting feel. 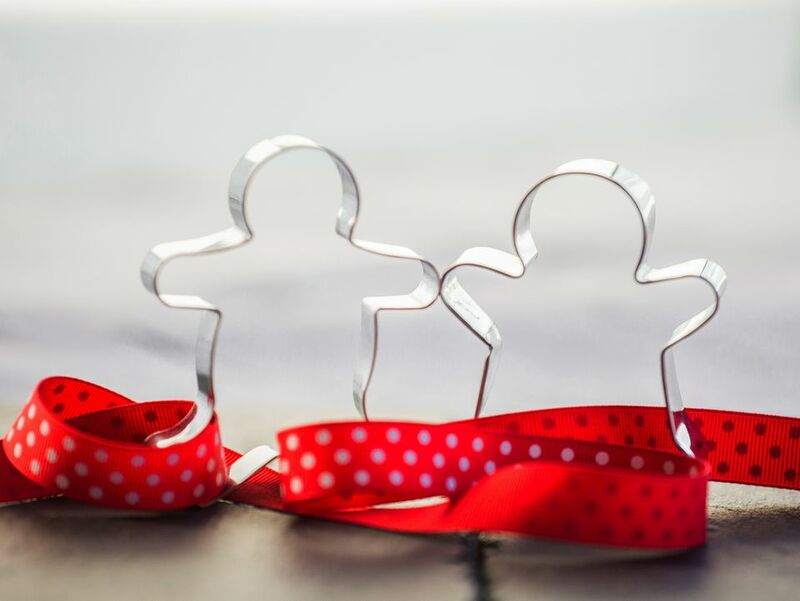 You can also use this activity to get ready for making ornaments with cookie cutters. For a young toddler, put the paint and cutters inside a newspaper-lined pan to prevent messes. Older toddlers with a bit more practice can use a paper plate. Both clean up easy. All ages should wear a smock or an old t-shirt. A DIY way to make a shape marker is by cutting the shapes like leaves into a potato. To make this activity toddler-friendly, place a craft stick or a fork into the potato so it's easy to handle. After you get the leaves printed, your toddler can dip his fingertip in red paint and add the berries. If you have large enough paper you can even make a wreath. Another activity that reinforces Christmas colors is playing with red and green play dough. Make it with Kool-Aid or add a few drops of peppermint extract and stimulate your toddler's sense of smell. Or make it without, add a drop or two of food coloring and let your child experience the mixing of color as he plays. Play dough is an activity that stimulates pure creativity and does so much to help your child master fine motor control. Tip: Use the same Christmas cookie cutters you used for the painting activity to make festive holiday shapes out of the play dough. Toddlers can participate in stirring, mixing, measuring and using cookie cutters. If you're not into baking or are short on time, try picking up a gingerbread house kit, most of which just require decoration. Use your gingerbread cookie cutter to trace and cut out a gingerbread man on cardboard that your child can decorate. Use a small dish of glue and a paint brush to brush the entire surface of the cardboard for decorating. This is good for young toddlers who can't yet control the amount of glue they squeeze out of a bottle. You can use decorative items like fabric scraps, little pom poms, buttons, red rickrack, googly eyes, puffy paint or just plain crayons, colored pencils, and markers. Using finger paints exposes your toddler to a unique sensory world involving sight, slippery touch, and squishy sound as well. Add mint or vanilla extract and excite his sense of smell, too. Finger painting helps your toddler gain fine motor control: Each time their hand moves the way their brain directs or expects, they are closer to full control of a paint brush, crayon or pencil. Tip: Line the table with newspaper or do this activity in a high chair for easy clean-up. Contact paper is a clean and simple way for toddlers to make collages and these ornaments look great on the tree or as window decorations. Just lay a sheet of contact paper sticky side up on a table and provide your toddler with collage materials. For a stained-glass effect use small scraps of tissue paper. When your toddler is done placing the pieces, cover the entire thing with another piece of contact paper, sticky side down. Then cut into shapes, punch a hole in each shape and use fabric or curl ribbon to hang where you'd like. When it comes time to trim the tree, you probably don't want your toddler involved in hanging lights or handling glass ornaments. Candy canes, however, are definitely something your toddler can keep busy with while being supervised by other decorators. Stringing popcorn and cranberries is a job for older siblings and adults. But, you can get your toddler busy alongside you by letting him string cereal, such as Fruit Loops or Cheerios. For younger toddlers, the stiffer the string is the better. Older toddlers can do this with yarn and a reinforced end. Do this by wrapping the end of the string with a bit of tape or wrap the end of the string around a pipe cleaner for easier threading. Making paper chains is too complicated for toddlers to manage alone, but it's definitely something that can be done with supervision. Also, remember that including your toddler in the steps of your own or an older child's project can yield good results and a feeling of success and cooperation for all.